Do you have a difficult international vehicle or ro-ro shipment on the horizon? RTM LINES’ knowledgeable and courteous professionals are experts at shipping personal and commercial vehicles anywhere by ocean. We will take care of your automotive and vehicle ro-ro shipments across international waters from start to finish, expertly guiding you through the process for a successful, safe delivery. We are often asked, ‘what is the best way to ship this car, tractor or crane overseas?’ Honestly, when shipping a vehicle as ocean cargo, there is no ‘one size fits all’ answer. Sometimes the best answer is to ship it as Ro-Ro cargo, other times it is better to ship it on a flat rack or maybe even in a container. Each shipment is unique. And, while we have identified…and answered…some of the most-frequently-asked questions below, we customize creative solutions for each client’s specific vehicle ocean transport challenges. At RTM, we solve problems. Contact us now and let us make sure that no matter the mode of shipment or where its final destination may be, your trans-ocean vehicle shipment has smooth sailing! To discuss your shipping needs or for a quote, either call RTM at (203) 750-8890 or email us at pricing@rtmlines.com. Q: Do you ship to…..? A: Virtually every time, the answer is yes. Q: Can you ship my…..? Q: How will you ship my vehicle overseas? A: It depends on the vehicle. Most vehicles that are in working condition including having good breaks may be driven on to and off the ship. This is called roll-on, roll-off or Ro-Ro cargo. Vehicles like trailers can be shipped as Ro-Ro cargo if it can be towed or placed on flat racks. Another option includes containerized shipping for classic/vintage cars, boats, and motorcycles. Q: What kind of paperwork is needed to ship my vehicle to another country? Q: What can be in the vehicle during transport? A: For a Ro-Ro shipment, only equipment that was part of the vehicle when delivered from the manufacturers is permitted. These items may include a spare tire in the trunk, manual, vehicle tool kit. The following items should be removed from the vehicle: antennas that cannot be retracted, pop out radios, car phones, tags for tolls, garage door openers, consumer added exterior racks (e.g., bike or luggage racks), and license plates. Vehicles may not be used storage lockers to transport tools or personal effects. No personal effects are allowed to remain in the vehicle during transport. Q: Are there any special considerations for motor homes? A: Propane tanks containing propane cannot be accepted. Tanks that are fixed on the unit itself must be certified as empty. Removable tanks must be removed prior to delivery to the port. Motor homes that need electrical power during the ocean voyage cannot be accepted. Prior to loading on the ship, motor home will be inspected and should not contain items that could be construed as dangerous or a security liability. Prohibited items include, but not limited to crates and boxes, flammable liquids, motorcycles/scooters, perishable goods, corrosive/explosive liquids or materials. Q: Can the vehicle have fuel in it? A: Only Ro-Ro vehicles may have fuel in them. Ro-Ro vehicles should be delivered with one-quarter (1/4) tank of gas – just enough to load and unload it, and drive to a gas station at destination. 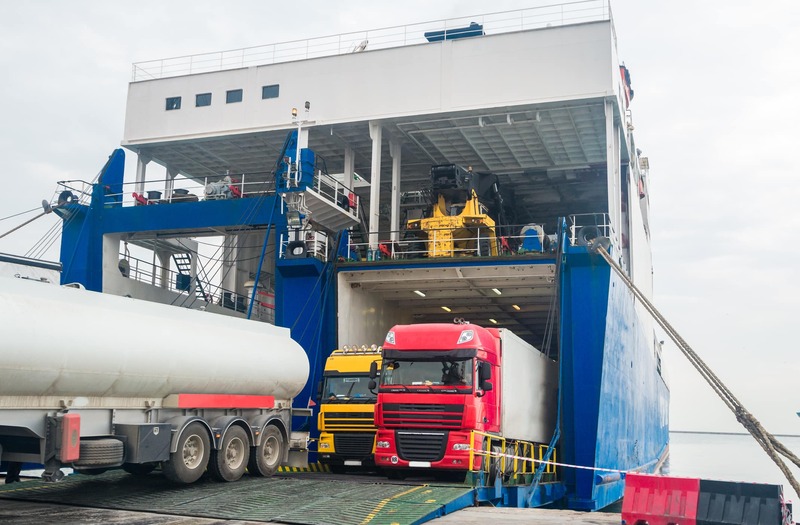 Vehicles shipped in a container may not have fuel in the gas tank. Q: What about the keys? A: Keys are either left in the vehicle or handed over to the terminal operator. Keys are transported with the vehicle, sometimes in the glove compartment. RTM recommends that the shipper keep a copy of the keys as backup. Give RTM a call at 203 750-8890 or email info@rtmlines.com.